SoftFuse Nice Tables is an visual HTML table generator. Just import your data, select any of numerous color schemes and hit "Generate!". Professionally looking online report, web catalog or product list is ready in minutes! 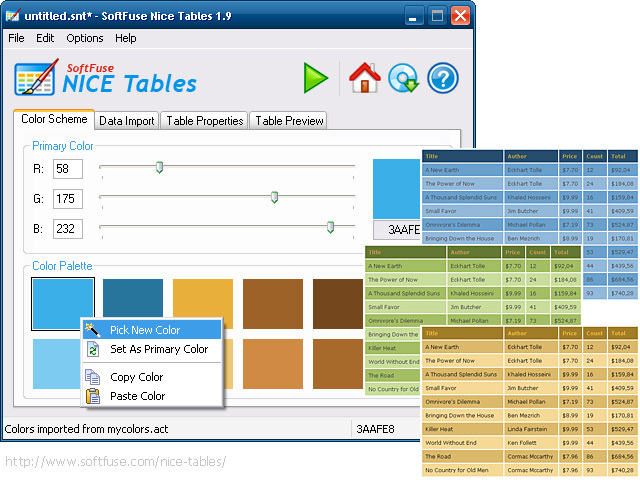 Do not waste time on studying html, selecting eye-catching color schemes and creating html-tables manually in notepad... Let SoftFuse Nice Tables do the boring job for you! Just a couple of minutes and a professionally looking, beautiful html-table or web-report is ready! Want your boss to be surprised at how smart your report or products' list look? Try SoftFuse Nice Tables for free! Create html-catalogs, price-lists and web-reports that will attract attention! Press release: Generate eye-catching html-tables, web catalogs, online reports and export them as an image or HTML! The recent update of SoftFuse Nice Tables 1.9.6 is packed with several improvements: export html tables as BMP-image and table preview resize. New additions will help to generate eye-catching html tables, reports and price lists more efficient way. DISTRIBUTION You are hereby licensed to make as many copies of the TRIAL VERSION as you wish and distribute it to anyone provided that all files are intact. You must distribute the install form of the TRIAL VERSION (you must distribute the setup file, not the files resulting of an installation). You are not allowed to sell the TRIAL VERSION (except payments for shipment and handling charges). Computer magazines are authorized to distribute it on any cover disk or CD-ROM without preliminary permission. Please inform us by email form at http://www.softfuse.com/contact.html each time you distribute the TRIAL VERSION of our Software. The TRIAL VERSION of the Software may be included in any free or non-profit packages or products. LICENSE AGREEMENT BEFORE PROCEEDING WITH THE INSTALLATION AND/OR USE OF THIS SOFTWARE, CAREFULLY READ THE FOLLOWING TERMS AND CONDITIONS OF THIS LICENSE AGREEMENT AND LIMITED WARRANTY. BY INSTALLING OR USING THIS SOFTWARE YOU INDICATE YOUR ACCEPTANCE OF THIS AGREEMENT. IF YOU DO NOT ACCEPT OR AGREE WITH THESE TERMS, YOU MAY NOT INSTALL OR USE THIS SOFTWARE! SoftFuse Nice Tables is shareware.